This page provides you with Real Estate resume samples that you can use for inspiration in writing your own resume, or for creating one through our easy-to-use resume builder. Below you'll find our how-to section that will guide you through each section of a Real estate resume. Your job is all about winning! And you are very well aware that, in order to win in such a competitive industry like yours, you need the best real estate agent resume sample to inspire you. Don’t worry, we are here to help you create the best resume you can think of. Real estate agents like you collaborate with clients, including developers and homeowners, to buy and sell property. Real estate agents are skilled negotiators, keen analysts, and clear communicators. Good people skills are integral to a successful real estate career, as much of the job includes managing relationships with buyers and sellers. We are here to provide you with a standout real estate agent resume! 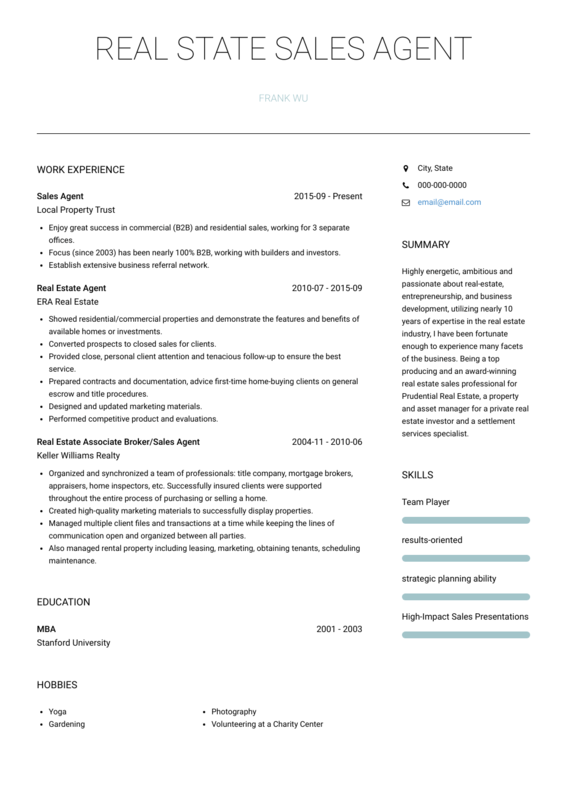 How to Write Resume for Real Estate? As real estate agent is essentially a sales role, your resume should be effective as a marketing document. You have to sell yourself—to both employers and clients—before you can start selling houses! We strongly suggest a reverse-chronological format for your real estate agent resume to showcase your best wins, your selling experience and your work history. Use your resume to showcase your passion for real estate and your sales acumen. Real estate is a booming market and a competitive field, so in order to stand out you need the best resume possible. Use a resume template that allows you to showcase not only your experience, but your passion. In client-facing positions like this, enthusiasm for the role is very important to hiring managers. Your summary section is your elevator pitch. It is a brief description of yourself and your experience that sells you and your skills to the employer. It shouldn’t contain any long paragraphs detailing every role you’ve ever held, but it should still give employers an idea of why you are the best person for this job. Fill this paragraph with technical terms. Write your work experience in reverse-chronological order, beginning with your most recent position and working backwards. With each position, write bulleted lists detailing your key accomplishments and successes, using measurable details wherever possible. Concrete examples of major initiatives that you spearheaded or deals that you landed look great on a resume. Your education section should include the degrees you have earned and the names of the institutions you attended. If you received any prestigious academic awards during your studies, they can also be included, as well as any important projects or memberships that are relevant to the position. Any extra-course or certification should also be included: make sure you take your time to complete the best real estate agent resume you can think of! Say you are good with the Internet: this is not 1996! Finally, if you are looking for the best real estate agent resume templates, you should check this masterpiece we have been working on here : many professionals like you have successfully used it to take their career to the next level.